Christopher Shults | IIE Blog Post, Part 1 of 3 | Parts 2 and 3 coming soon! Within colleges and universities, few offices interact with more academic programs, educational and student support units, or backbone administrative offices than the office responsible for institutional effectiveness. For the purpose of this blog and in alignment with our definitions at AHEE, I am using the term institutional effectiveness office and professional to refer to anyone responsible for the traditionally understood planning, assessment, or institutional data management functions. These professionals provide evidence, gather information, conduct research, facilitate or lead the work on accreditation, support faculty-led efforts to assess student learning, and provide presentations that impact all areas of the institution – both in the classroom and within the Administrative, Educational, and Student Support (AES) areas that impact and support the environment for student success. Outside of Human Resources and the Finance Offices, no units have a greater understanding of the operational functions of the institution and none have greater impact on strategy development and evaluation. AHEE is an association that has taken on the mantle of supporting the professionals and staff who lead offices responsible for the planning, assessment, evaluation, research, and accreditation activities at their institutions. We believe that it is the integration of these often siloed and disparate efforts that lead to greater opportunities for improving the student experience, learning, and ultimately, outcomes. The model shown below demonstrates the interconnectedness of these activities and the remainder of this blog post series will demonstrate how an integrated approach to institutional effectiveness within each of the three main categories positions institutions of higher education to better leverage resources, engage in shared learning, act upon information and evidence, and improve effectiveness. This first post within this series addresses how accountability impacts the direction and evidence and evaluation elements of the IIE model. The second and third posts in the series demonstrate how the direction and evidence and improvement sections impact the other elements. The purpose of this blog post series is to detail the interconnectedness within the model, which is the foundation of an integrated IE philosophy and approach to enhancing student success. Institutions of higher education have historically approached the reaffirmation process, and particularly the self-study process as one of compliance where documenting evidence of criteria is key. As the accreditation liaison and self-study coordinator of a recent (successful) reaffirmation process, I would also suggest that colleges and universities approach the comprehensive two-year self-study process as the best opportunity to review and develop a commitment towards the mission, vision (if applicable) and institutional goals; inventory and utilize evidence of student learning and the environment for student success in academic programs and AES units to significantly impact student success; and explore and address both trends and equity gaps regarding student outcomes. As the federal government has increased pressure on the Council on Higher Education Accreditation (CHEA) and the seven regional accrediting bodies, criteria for reaffirmation have become increasingly rigorous and failing to use the self-study process as a comprehensive, interconnected, and introspective process places institutions of higher education in greater risk of sanction. A major reason that many institutions struggle during the self-study process is that they fail to employ an integrated institutional effectiveness approach and then attempt to respond to criteria through the same siloed approaches. Maintaining an office that is responsible for institutional data management, collection, and reporting as well as planning activities ensures that data on student success is regularly gathered, analyzed, and presented to decision makers. By having an office that is regularly charged with gathering and reporting student outcomes data across academic programs and AES units, the institution has likely upheld annual processes that evaluate and report on student outcomes, tracked the impact of grant-funded pilot programs targeting specific populations, and inventoried the use of program and unit reviews to impact assessment activities. If this integrated institutional effectiveness office is headed by an individual with cabinet level authority, then there is an even greater likelihood that discussions about the successes and interconnections between activities that span units and divisions have occurred and changes have been made. In these instances, the self-study process becomes more of a reporting out process, by criteria, than one characterized by rushed data gathering, the creation of new reports, and retrofitting past data into emerging reporting systems. Let me be absolutely clear, accreditation requirements and criteria should not be viewed as the impetus for engaging in institutional advancement efforts aimed at enhancing student learning and improving student outcomes. Rather, the criteria help to define a framework that addresses the planning, assessment, evaluation, and evidence gathering functions essential to systematic and intentional improvement of student success. Each of these aspects must be designed and implemented in alignment with institutional values and consideration of the uniqueness of the culture, but must also allow for effective response to accountability standards. In short, these standards help guide, but should not drive institutional improvement. 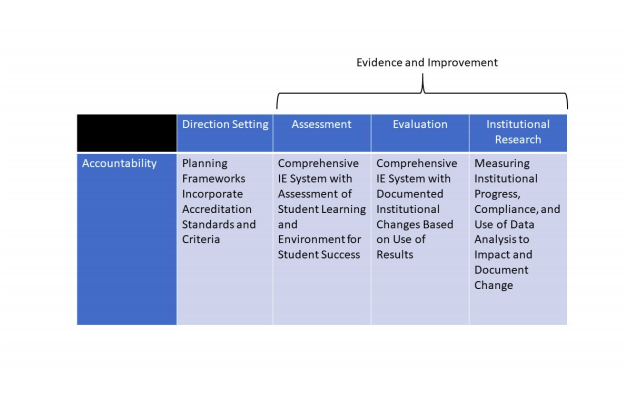 The graphic below demonstrates how accountability criteria, in an integrated model of IE, helps provide structure to the direction setting and evidence and improvement aspects of the model. Christopher Shults is Dean of Institutional Effectiveness and Strategic Planning and MSCHE Accreditation Liaison at the Borough of Manhattan Community College and Vice President of the AHEE Board. He has served on/led self-studies in three regions, authored/coauthored numerous publications and presentations on effectiveness, assessment, and leadership, provided regional accreditation workshops, and is currently working on a book designed to help community colleges build student focused business models.